"A brutal, mesmeric debut novel." "A rollicking, offensive, and genuinely enjoyable ride." " To enter Sullivan's first novel is to spend quality time with some of the worst people in the world." "An insightful gut-punch to the soul for any reader tough enough to take it"
"One of the most violent novels CanLit has ever seen"
"In some of the sharpest prose anyone is writing today, Andrew F. Sullivan vividly brings to life some of the most damaged and sorrowful characters ever encountered in fiction. Mark my words, Waste is going to be considered one of the best books of the year." "Balancing tenderness and brutality in the palm of his hand, Andrew F. Sullivan has carved out his own category to capture the ugliness of the world, his words always in search and service of some beating heart beneath the dirt. With Waste, Sullivan's deft prose hammers out a harsh, hard-fought harmony that compels you to sit down and listen." "An unflinching, black-hearted story told with relentless, straight-razor prose. Waste, Andrew F. Sullivan's brilliantly concussive new novel, reminds me most of a literary cage match: busted, doomed characters tumbled together with no hope of escape--and it all makes for one hell of a show." 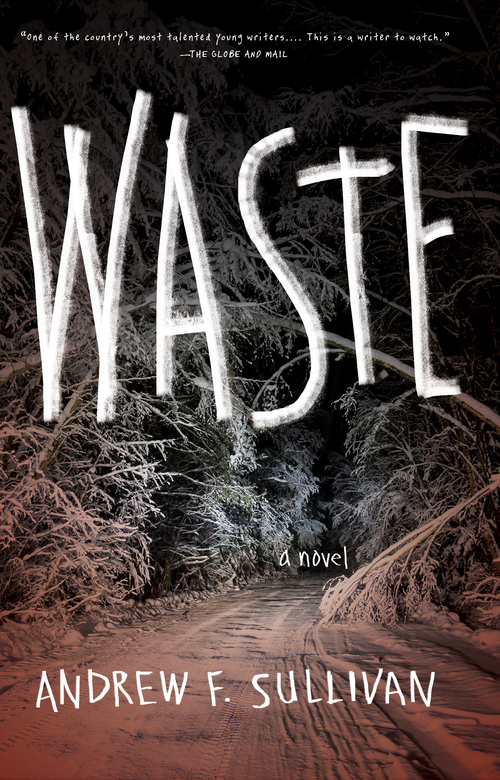 "Waste is a brutal, mesmeric debut novel." "Waste is a rollicking, offensive, and genuinely enjoyable ride." "One of the most violent novels CanLit has ever seen." "A confident storyteller whose darkly humorous and down-market prose has the cumulative effect of a Jackson Pollock canvas – except instead of paint, Sullivan’s medium is blood." "Waste continually tugs at our emotions. While his outlook and subject matter may be bleak, [Sullivan] is an unquestionably talented writer." "Waste is an insightful gut-punch to the soul for any reader tough enough to take it"
"Sometimes you don’t learn from events so much as you witness them. That’s what Sullivan has done here. He’s stood witness to people lost and forgotten, the dross of capitalism, the runoff of greed." "No matter how steeped it may be in darkness, this novel is the basic story of, as Faulkner put it, the human heart in conflict with itself." "Like watching a ’70s Italian horror movie while walking naked on a bed of coals." " A blown pupil of a novel"
"A brilliant if bleak vision from a biting new voice"
"To enter Sullivan's first novel is to spend quality time with some of the worst people in the world. " "Waste offers a visceral reminder of the forces that keep people overwhelmed by inertia, stagnant and unable to act in their own best interests." "No shortage of dirt here: this is suburban Canadian Cringe-Lit at its finest." "The same tone of brutality and hilarity that Harry Crews created in A Feast of Snakes"
"Waste does not offer a choice between good and evil, but between the seriously flawed and the amoral. It may not be the choice we want, but it’s the only one we’re given." "Sullivan’s Larkhill is all terminal cases, and if he can’t save these lives, he at least honors them." "It’s basically the larger, looming character that conjures up all the evil found in these pages." Joyland - "The Brothers Vine"
The Nervous Breakdown - "Pawned"
Little Fiction - "Simcoe Furriers - WASTE Outtakes"
The Globe and Mail - "Darkness on the Edge of Town"
CBC Books - " 2016 Writers to Watch: Andrew F. Sullivan"
The National Post - "Redefining Masculinity in Canadian Lit"
CBC - "How Andrew F. Sullivan Wrote One of the Most Violent Novels CanLit Has Ever Seen"
CBC Radio - "Andrew F. Sullivan on The Next Chapter with Shelagh Rogers"
Canadian Notes & Queries - "Unwanted Parts: Class Unconsciousness in Debris and Waste"
Broken Pencil - "Waste Case: The Hardboiled Darkness of Andrew F. Sullivan"
Largehearted Boy - "Book Notes: Andrew F. Sullivan's WASTE." The Scope - "Moses Moon's Mixtape"
VICE - "WASTE and How You Feel About Oshawa"
Oshawa Express - "Looking ahead to a 'blockbuster year'"
Oshawa Express - "The Horrors of Larkhill"
Quill & Quire - "Invisible City"
HerCampus - "Canadian Books to Pick Up This Fall"
Quill & Quire - "Looking Outside Our Borders"
Necessary Fiction - "Renovating with the Easter Bunny"
Monkeybicycle - "If My Book Was A Trailer Park Boy"
Canadian Notes and Queries - "Andrew F. Sullivan Interview"
Open Book Toronto - "The Proust Questionnaire"
Publisher's Group Canada - "You Find Your Stories in the Dirt"
Open Book Toronto - "Awful People Still Exist: Interview"
The Puritan - "The Novel is Not a Moral Compass"
Ryerson Folio - "Writers on Writing - Andrew F. Sullivan"
Open Book Toronto - "What I Wish Someone Had Told Me"
The Fiddlehead - "An Interview with Andrew F. Sullivan"
Slow City - "Novelist Andrew F. Sullivan lands at The Garrison"
The Nervous Breakdown - "Andrew F. Sullivan - Self Interview"
The Globe and Mail - "16 Most Anticipated Canadian Books of 2016"
Toronto Life - "The 14 books you have to read this spring"
The Walrus - "What We Read: Life Is Full of Unpleasant Surprises"
Toronto Star - "Five Up-and-coming Writers to Watch in 2016"
CBC Books - "Spring Reading List 2016"
Publishers Group Canada - "The Reading List: March 2016 - WASTE"
Library Bound - "Staff Favourites for April 2016"
W.Dish - "March Book Picks: Three New and Innovative Writers"
Quill & Quire - "Spring Preview 2016: Fiction"
The Shakespearean Rag - "Sixteen for ’16: sixteen titles to watch for this spring"
Amazon.ca - "Spring 2016: Spring Books Preview"
Real Style - "New Books for the Proudly Canuck Reader"
The 49th Shelf - "Most Anticipated: Our Spring 2016 Fiction Preview"
Joyland - "Soon To Be-Best Books of 2016"
Martin Sales Agency - "Book of the Week: WASTE"
Joe Frontel in Broken Pencil.